Put the quinoa in a sieve and rinse in cold water. In a large microwaveable bowl with a cover, add the rinsed quinoa and 1¼ cups water. Cover and microwave on high for 9 minutes. Let sit for 2 minutes then stir. Quinoa should be tender enough to eat, but with a little “pop” upon biting. Set aside. Put the lentils in a sieve and rinse in cold water. In a saucepan, simmer the lentils in 2 cups of water until tender but not mushy, about 30 minutes. Drain and cool. In a small bowl, whisk the mustard and vinegar together and drizzle in the oil to make an emulsion. Add the garlic powder, lime zest, salt and pepper, to taste. 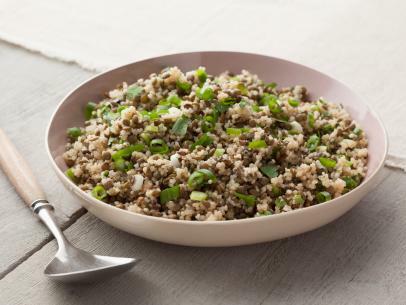 To assemble the salad: In a medium salad bowl, mix the quinoa, lentils, green onions and chopped cilantro. Top the salad with the dressing; toss to coat and serve.